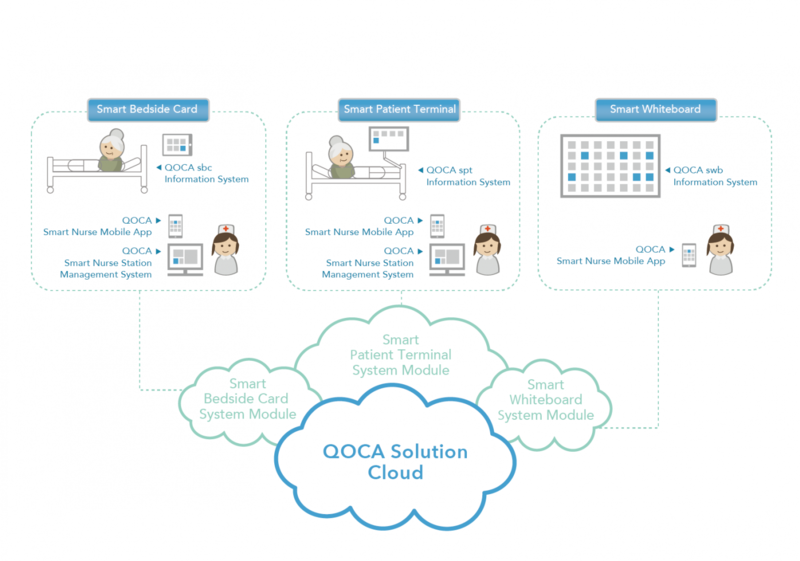 QOCA® Smart Hospital Solution is designed to reduce hospital workload and simplify the management process. It consists of a Bedside Care System and Smart Whiteboard. The Bedside Care System is comprised of mobile care devices, nurse station and bedside terminals. For the nurse, it provides mobile nursing records and group broadcasts so as to reduce nurse workload. It can also arrange bed assignments and schedule shifts, and deploy the hospital’s existing system (e.g. meal order app) to simplify the management process. For the patient, an emergency button, personalized reminders and entertainment programs are provided in the bedside terminal to improve patient-doctor relationship and facilitate a patient-centric environment. 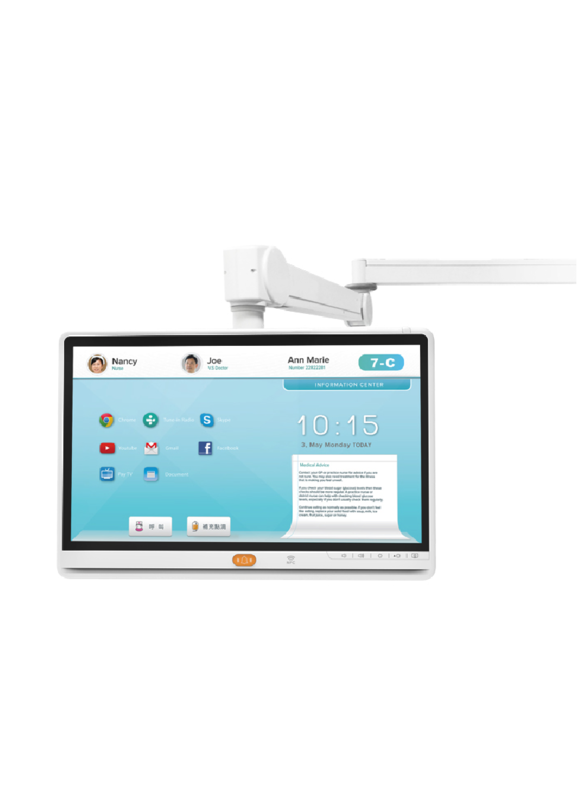 In order to avoid the trouble of repeating copying and writing, the Smart Whiteboard assists nurses to facilitate bed assignments and shift schedules in real-time and eventually helps to meet the requirements of hospital accreditation. - Personalized entertainment: TV, radio, games, video call, social network, etc. - Mobile nursing record of patient list, vital sign, etc. 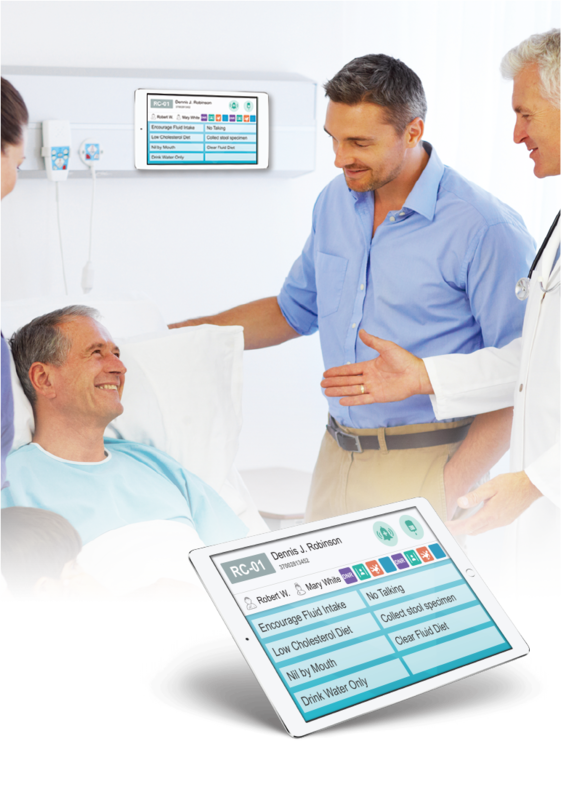 QOCA® sbc improves the normal bedside card, and provides real-time care information (e.g., shift arrangement, attending physician, care reminder), service call and patient information. Thus, it not only helps nurses reduce the care workload, but also empowers the hospital to provide professional and reliable service with limited budget. QOCA® swb assists the nursing staff in real-time management of bedside duty shifts and nursing shifts, eliminating the cumbersome tasks of repeated copying and writing, and will easily meet the requirements of hospital accreditation. Affiliated Zhongshan Hospital of Dalian University is a medical center with 2200 beds, integrated with medical services, teaching and scientific research. Its International VIP Ward also made reputations abroad for excellent medical skills and services. In order to advance patient-centric services, Zhongshan Hospital has implemented QOCA® spt solution, which supports real-time communication, access to personalized care plan, and online meal ordering, etc. QOCA® spt helps Zhongshan Hospital to increase inpatients’ satisfaction while reduce staff’s workload. If you would like to receive more information about QOCA® Smart Hospital Solution, please contact us by filling out the form below. Thank you.